Saving money is something that most people like doing, and a lot of it has to do with how much money is spent when using items that you already have. Recurring expenses like electricity and utilities can add up quickly over time, especially if you own a lot of items that use these kinds of resources. Knowing this, electronics designers and manufacturers are coming up with new ways to conserve energy. One area where this is coming into play is in swimming pools. Eco Saver, a company that specializes in green solutions to common problems, has come up with a solar-powered heating system for swimming pools. Keeping pool water correctly conditioned to a safe swimming temperature can often have a large impact on your electricity bill, costing you tons of money every month. Fortunately, there’s now a viable solution to this with Evo Saver’s 20-foot solar heating panel system. While Eco Saver claims a raise in temperature by 10 to 15 degrees Fahrenheit, your actual results will vary based on a number of factors, with the ambient temperature and amount of solar input being the most important. Typically it takes about 5 to 6 hours in order for it to raise temperature to its maximum, so you may be waiting some time before the pool is usable. One nice aspect is that the solar panels are 20% wider than most other panels on the market, giving it a slight boost in heat output. It’s still nowhere near perfect, but it’s overall quite solid. A 20-foot panel can heat a 15x30ft in-ground pool, both round and rectangular. It can also heat above-ground pools of up to 24 feet. It should be more than adequate for most of the common swimming pools out there. The best part is that the panel has a very modular design, allowing you to purchase and attach more solar panels so that you can later expand your heating area. The price is perhaps one of the strongest points. At only $150, it’s a relatively inexpensive solution to heating your pool. It may take a bit of time for it to completely heat a pool, but it makes up for it in how much it saves in electricity in the long run. It takes off a lot of the financial burden from maintaining a pool, making it a worthy investment. You can’t really go wrong with a heating system like this. Its biggest downside is that installation can be somewhat of a pain; you need to find an ideal location where there’s always sunlight, and you need to fine-tune the angle in order to get the most out of it. Fortunately, if done properly this should only have to be done once. Otherwise, it’s a very inexpensive way to keep your pool swimmable, both in terms of up-front cost and in your electricity bill. Just note that the setup procedure is a little involved. It’s certainly not difficult, but it can take a while. Once it’s up, though, it tends to work quite well. 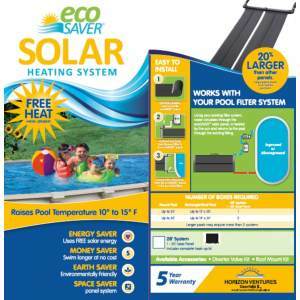 This Eco Saver solar pool heater gets an overall rating of 4 out of 5 stars. Do you have experience with solar pool heaters? Please leave a comment, we would love to hear your thoughts.